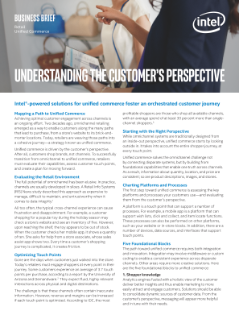 Explore this brief and see how Intel®-powered solutions are helping retailers successfully transition from omnichannel to unified commerce by optimizing customer touch points, and building foundational capabilities that enable one truth across channels. Performing your Windows* 10 migration on the latest Intel-powered devices enhances both security and productivity. See the retail benefits of mobile devices featuring Sales assist, real-time inventory, secure mobile payments, and more. Intel® technologies are helping customer experiences get personal at the National Retailers Federation's (NRF) Big Show 2017.